The sounds and music are important parts of video, which complete the video and make it more intelligible. However, there’re also some embarrassing moments that you may find the audio not suitable to the video clip. It’s also discouraging when some unwanted sounds captured along with filming. For those issues, one of the best solutions is to remove audio from video. I’d like to share some effective methods to fix such problems in the following parts. Absolutely, you can also dub video with your voice or certain sound tracks when you have muted the video. It would be quite interesting, right? Apowersoft Free Online Video Converter is a popular web-based application that can help you delete sound track from your video clips. Absolutely, it won’t reduce the video quality after removing the sound track. Actually, the option for adjusting volume is a part of the editing function. 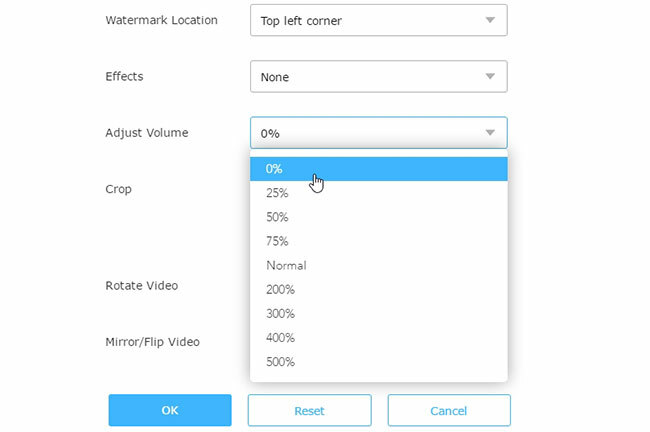 This online tool offers multiple editing options like trimming, adding effects and watermark and so on. You can do as follow to operate this application. Visit the site of Free Online Video Converter. Browse and select the target video file from your local folder. Click “Edit” button to activate editor. Drop down the menu of “Adjust Volume” and then choose “0%” option. Press “OK” button to confirm the configuration. Beyond that, the converting function of this tool is also good to use. It is capable of recognizing various types of media files and converting them to the most of popular formats including MP3, FLAC, MP4, AVI and even GIF. Cloudconvert is also efficient in removing the audio part from video file. 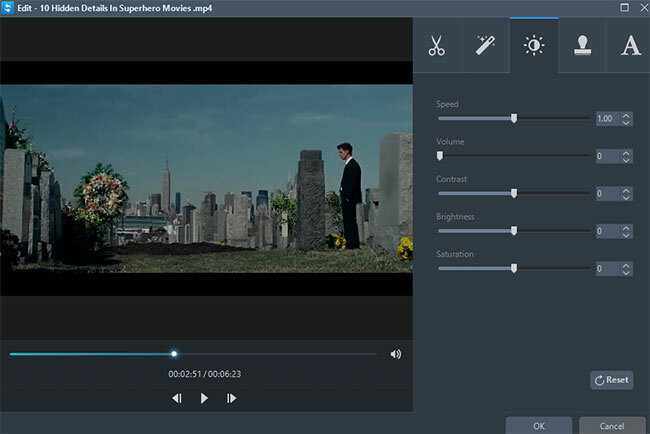 Upon the intuitive interface, you will find a practical built-in editor that provides different editing options including changing audio settings, trimming, adding subtitle files, etc. Absolutely, as the name indicates, this application also allows users to convert media file formats with no quality loss. To know how to remove audio from video with this tool, you can check the instructions below. Go to the page of Cloudconvert. Press “Select Files” button to browse local video file. 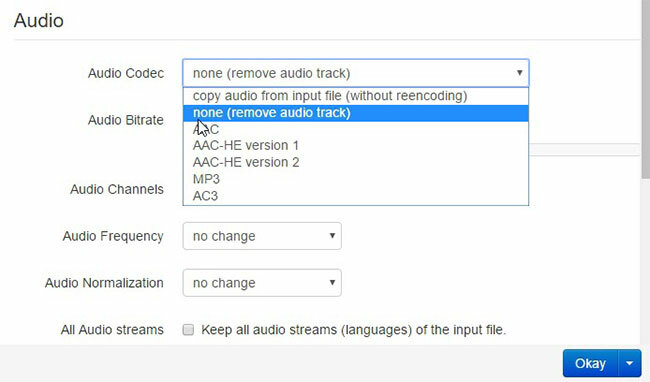 Drop down the menu of “Audio Codec” and then choose “none (remove audio track)” option. Press “Okay” button to confirm changing. Click the button of “Start Conversion”. Absolutely, if you are reluctant to use those online tools, there’re also many desktop programs perform nicely in this aspect. 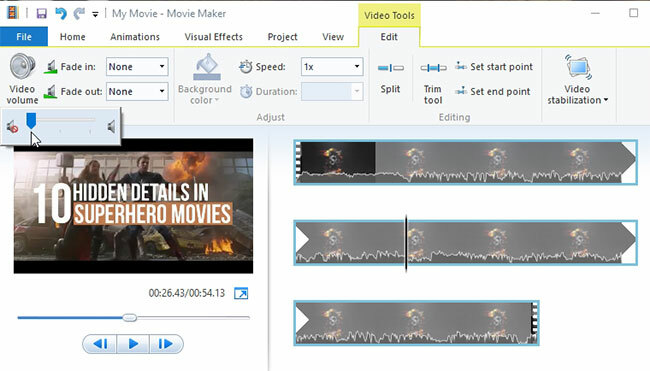 Windows Movie Maker is an editor for Windows users, which was developed by Microsoft. This application can help users to edit different types of media files like image, video and audio. Upon the interface, you will find this tool features multiple editing options, such as trimming, rotating, adding effects and transitions. Plus, you can publish the edited video on YouTube immediately with this application. Do as follow to mute audio with this tool. Drag the video into the program. Go to the “Edit” tab > “Video volume” and then switch the volume to the minimum. Press “File” button and then choose “Save movie” > “Recommended for this project”. Another program is called Video Converter Studio which perfectly integrates video converter and editor. This tool supports most of media files and provides various formats for conversion. Also, benefiting from its advanced technology skill, the output video will maintain the original quality after editing and converting. Furthermore, it is also equipped with some practical tools like video downloader, screen recorder and MV maker. Follow the steps below to remove audio from video. Download and install Video Converter Studio. Click “Edit” button to activate video editor. Go to the tab of “Effect”. Switch “Volume” option to zero. Press “OK” to confirm settings. Click “Convert” button to start. All of those methods perform greatly in deleting sound track from video. You can choose one that you like best to remove audio.